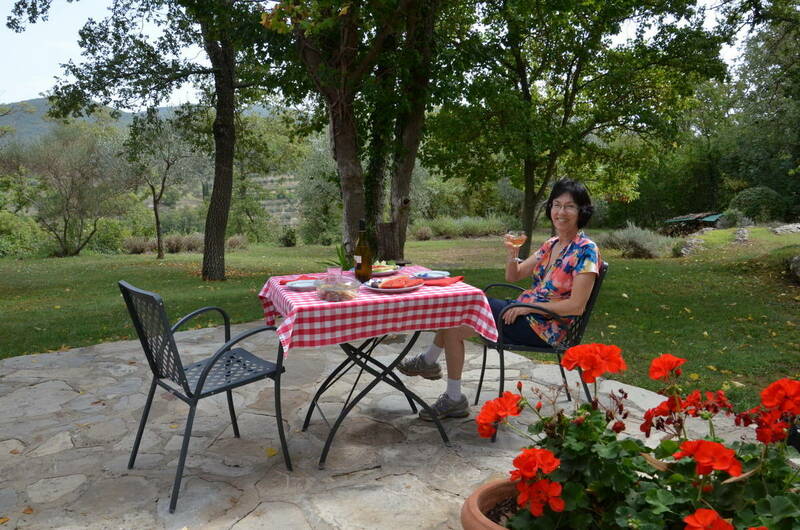 During our several night stay at Il Colombaio di Cencio Vineyard near Gaiole in Chianti, Italy, Bob and I enjoyed a leisurely pace where we set our own schedule. 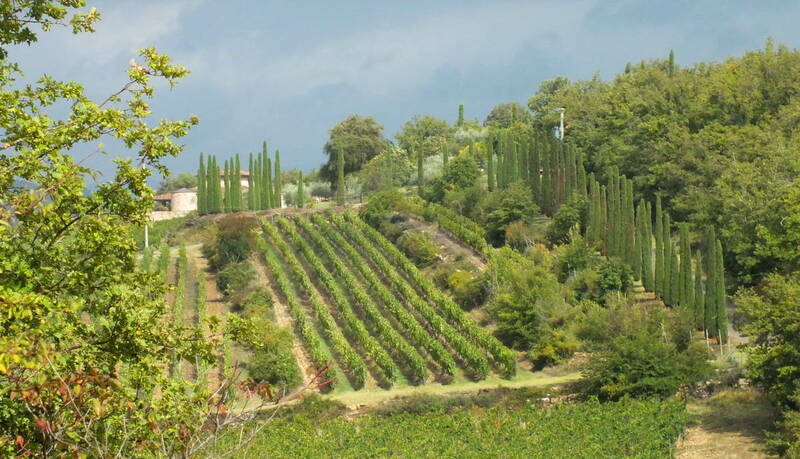 The morning after a day trip to the Leaning Tower of Pisa and Cinque Terre, we awoke to a subtle clangor emanating from the sleepy, sun-drenched vineyard. 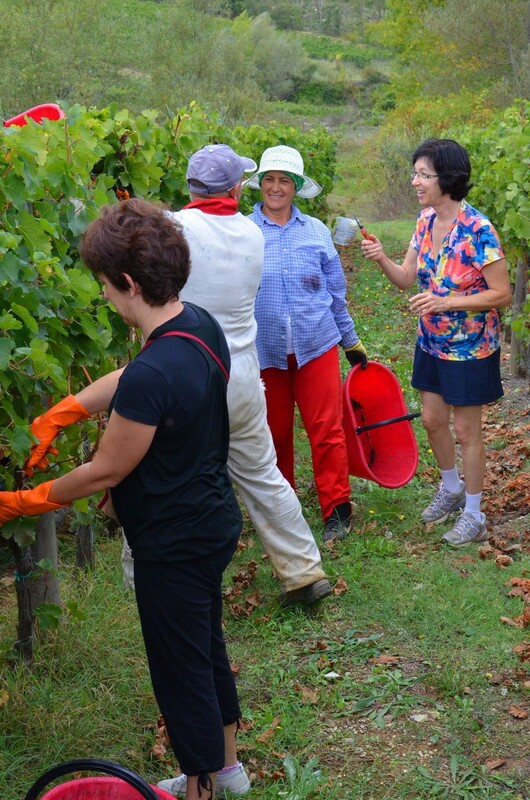 Soon after, we found ourselves helping with the grape harvest in Tuscany. From the dooryard of our farmhouse accommodation, a quick glance revealed the source of the underlying metallic rattles, occasional knocks and gentle rumbles that were muffled by the heavy moist air clinging to the sides of the valley. 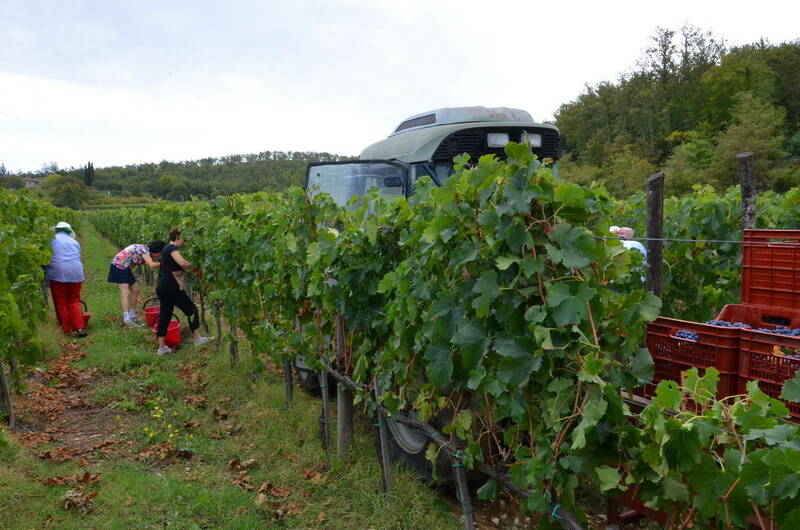 The crew of harvesters had been spurred into action by bright sunshine following the recent rains. 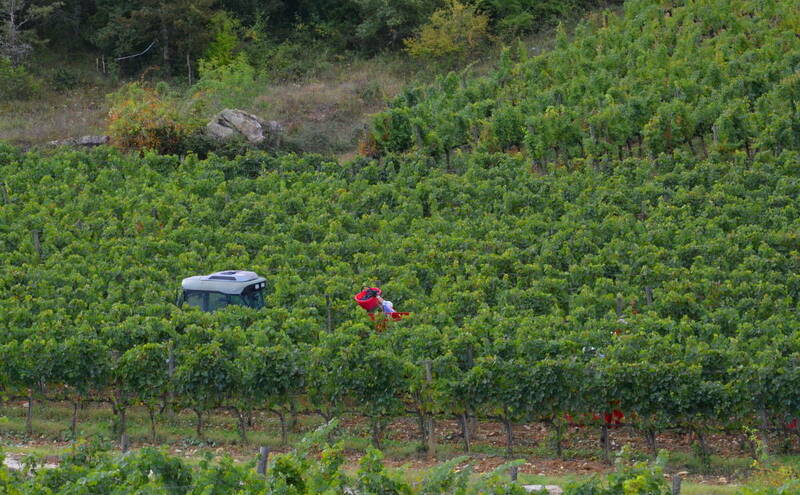 As we looked on, every so often a red bucket would magically appear and float above the vines. 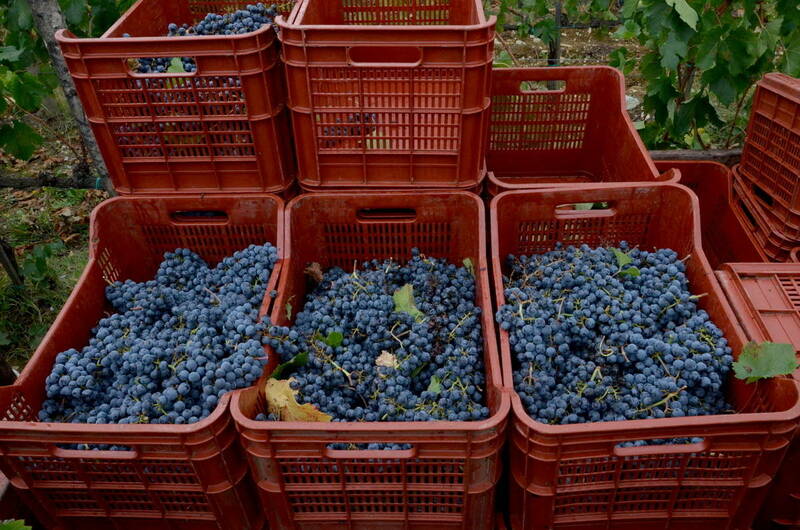 Even from a distance, we could see plump, purple grapes overflowing the modest-sized container. 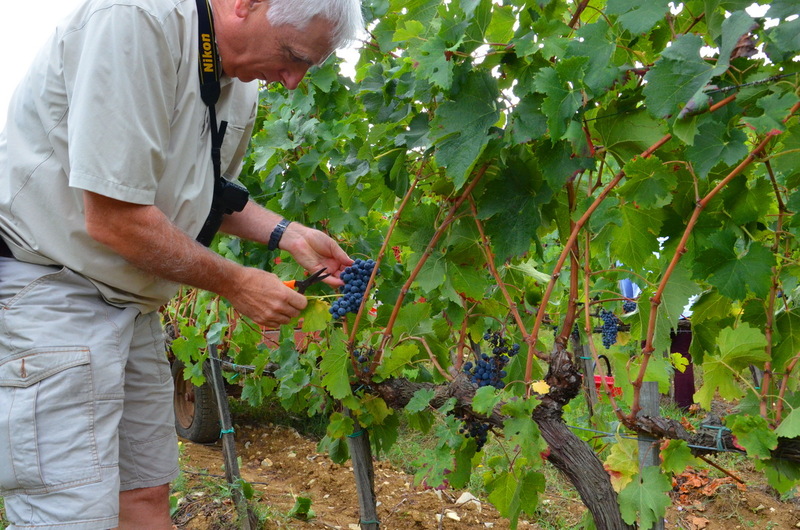 Bob and I decided, on the spot, to immediately head into the vineyard to witness the process. 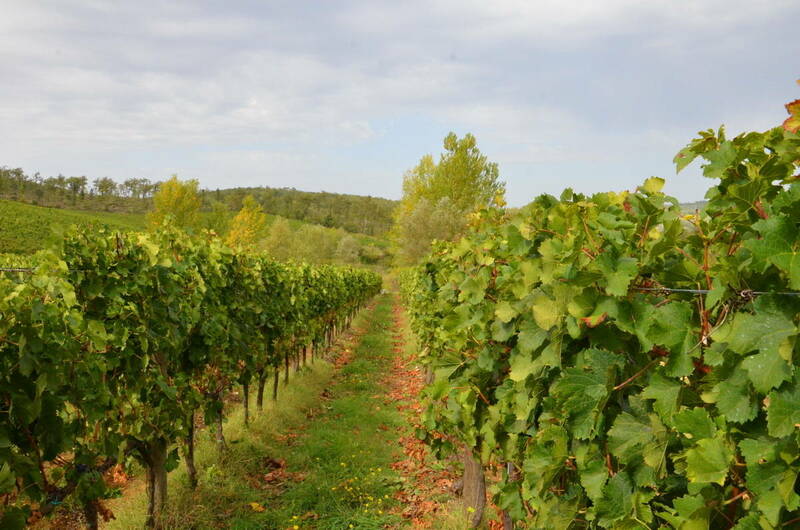 To get to the bottom of the vineyard, Bob and I had a fair distance to cross, but the terrain was all downhill, so we were able to weave our way through the rows quickly. Once surrounded by the tall plants, it took a bit of searching to find the pickers and their machinery. We were glad that the tractor was occasionally fired up providing a clue to the present location of their work. 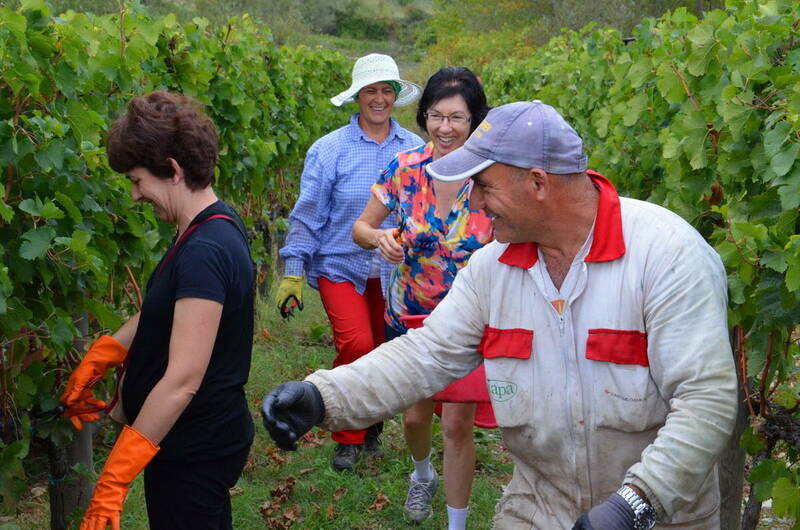 It turned out that there were only three people working to harvest the grapes that day, two women and a man. 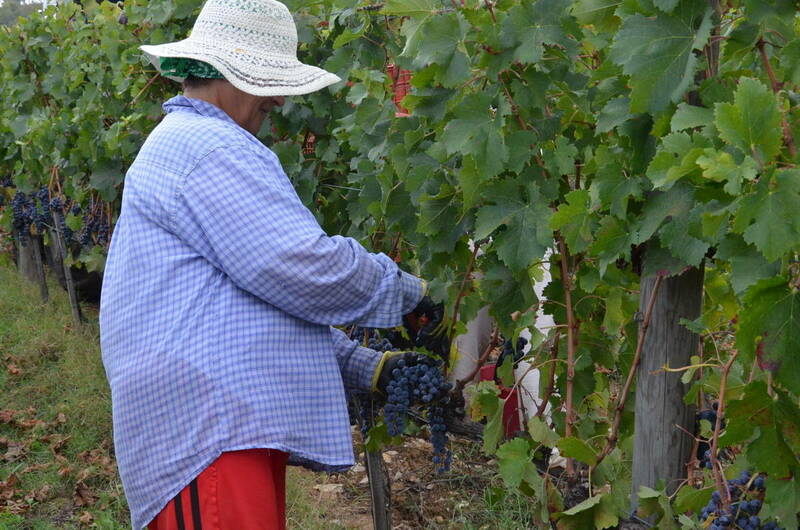 We were intrigued by the quick and methodical way that each of them nipped off the weighty clusters of grapes from the top of the vine to the bottom. It sure wasn’t rocket science, but attention to detail was still important in order that few grapes tumbled to the wet clay. Enthusiasm was oozing out of Bob and me so the leader of the picking crew conveyed to us that we could participate in the harvest if we would like. None of the three pickers spoke English, and neither Bob nor I speak a word of Italian, but when the clippers were offered to me, I got the message and could hardly wait to begin. 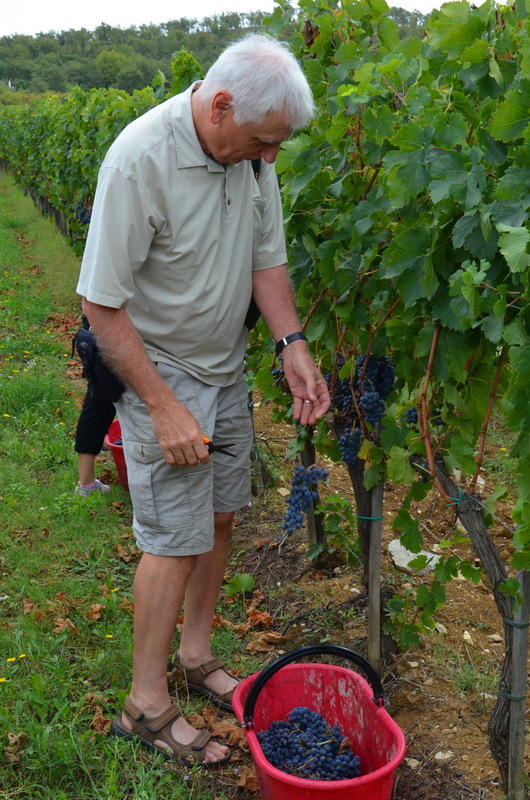 The head picker was overjoyed at our keen interest in the task and promptly indicated a section of the vines where I could begin collecting the grapes. The women worked so deftly that they caught up to me in no time and passed me by. I worked hard at picking up my own pace and soon wielded the clippers more quickly. I did not want to hold up the ladies. 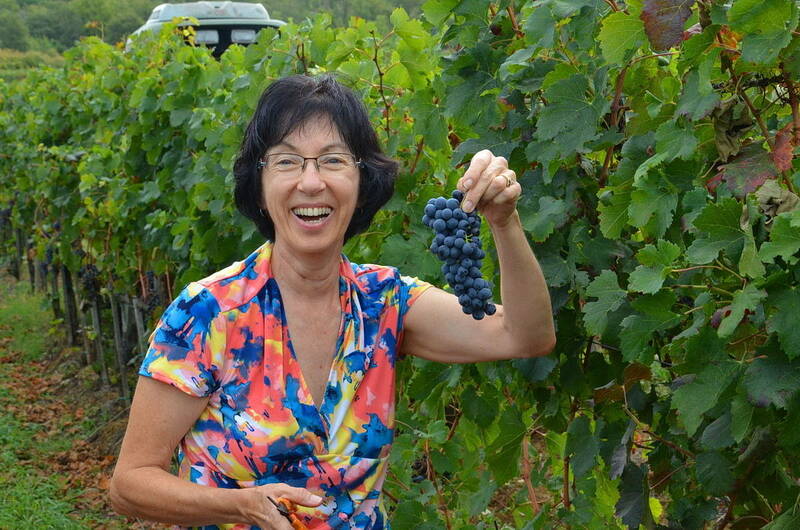 Since I am familiar with using pruning shears in my own garden, the method of cutting off the bunches of grapes was nothing new to me, but sometimes, untangling the clusters from the vines required a bit of patience. Those tendrils are tough and strong. 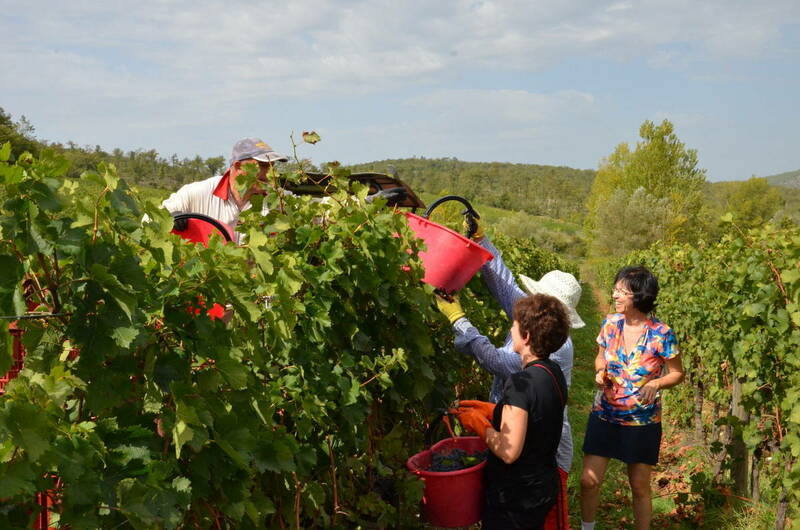 It was imperative to look under all the large leaves of the vines because the grapes were ripe and ready to be harvested, and the pickers did not want to leave any behind. Then it came Bob’s turn to give it a try. By then, I could see why the pickers wore rubber gloves. My fingers were stained purple! 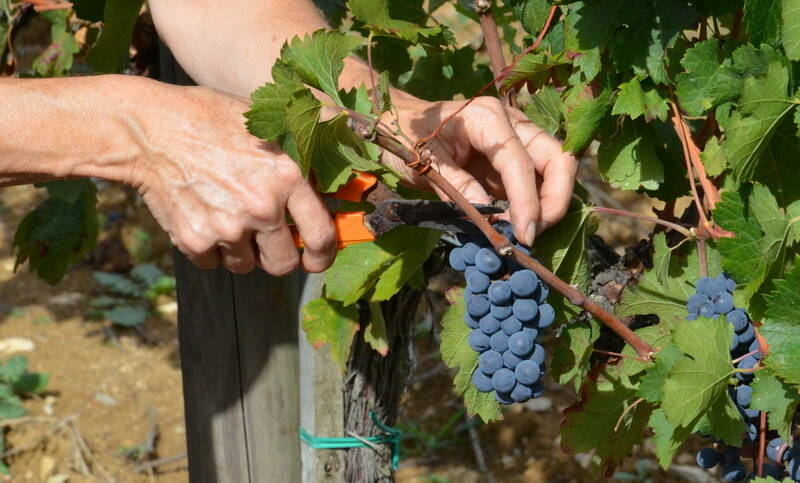 No special care is taken when placing the weighty grape clusters into the buckets. 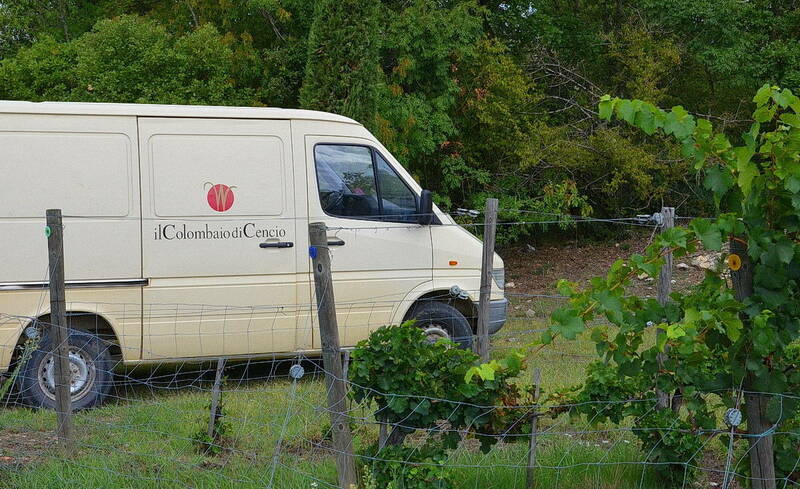 They will be crushed, after all, once at the winery. 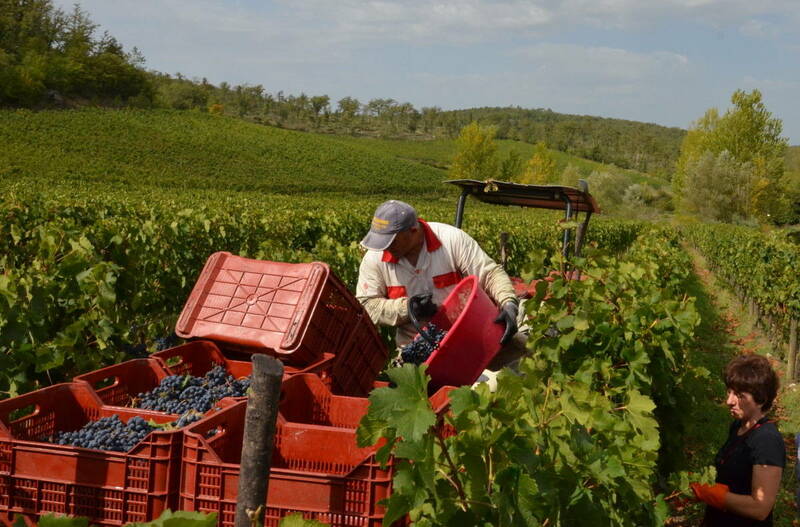 Each bucket could be filled with sweet grapes by harvesting from a very short stretch of the vines. 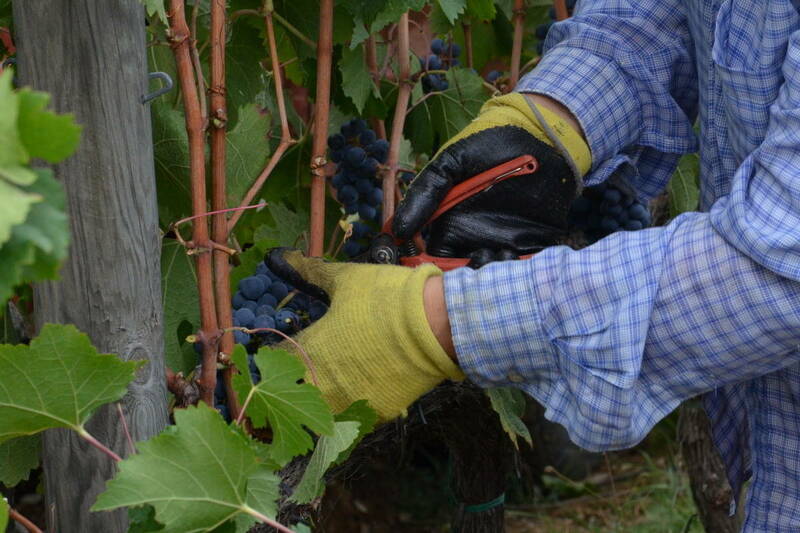 in order that their full buckets could be handed up and over the vines to his outstretched arms. 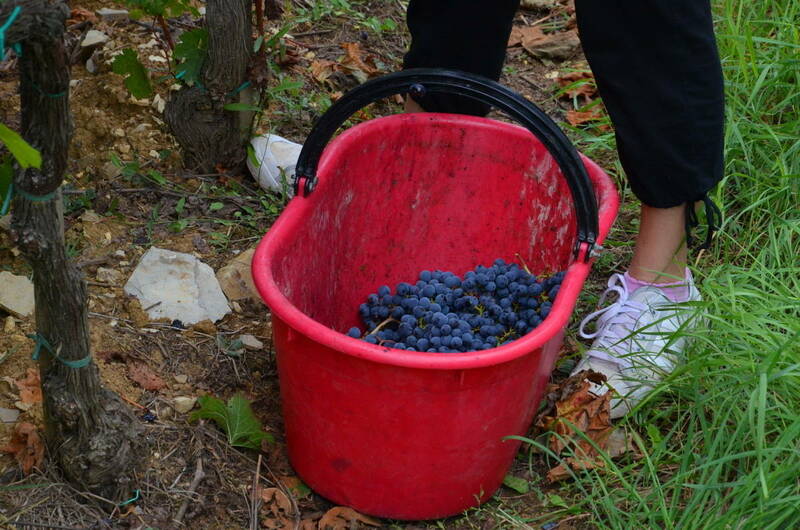 The contents of each bucket was promptly dumped into a crate on the grape wagon. Bob was really getting into the swing of things. The pickers were quite impressed at my newly-acquired skill and appreciative of the help. I could almost match their speed. 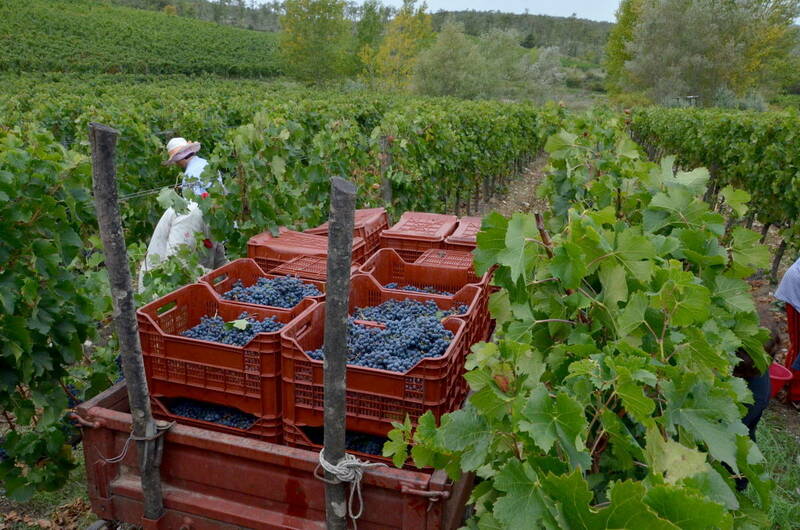 As each crate on the grape wagon was topped up, a lid was placed securely on it in order to stack the crates for stability during the ride up to the winery. 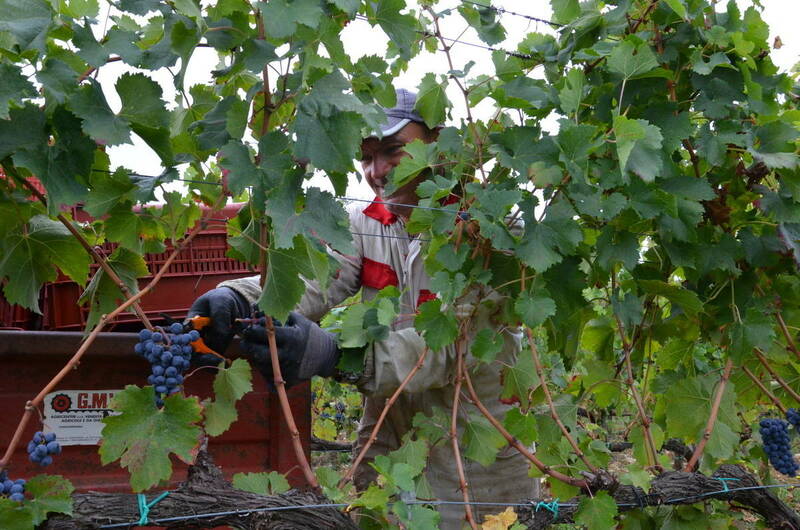 The sweet ripeness of the grapes scented the air as everyone bent to their task. 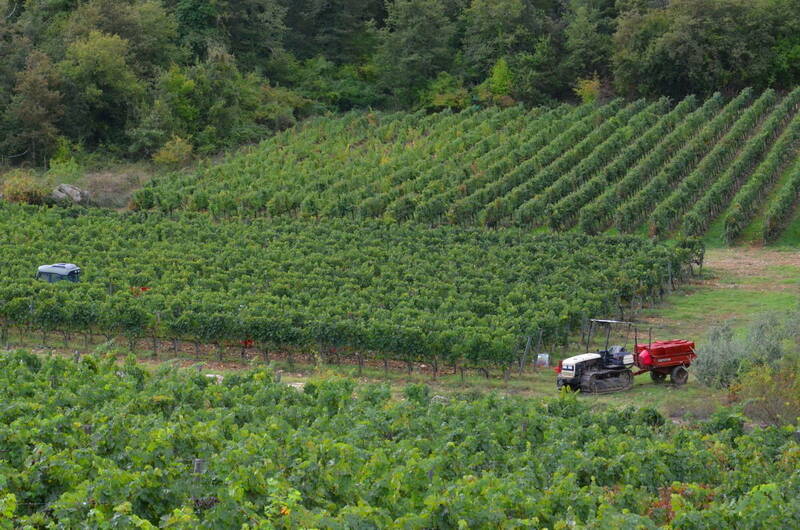 Once the head picker determined the grape wagon fully loaded and ready for transport to the winery, he fired up the tractor and proceeded to haul the wagon carefully along the parallel rows and over the bumpy ground. 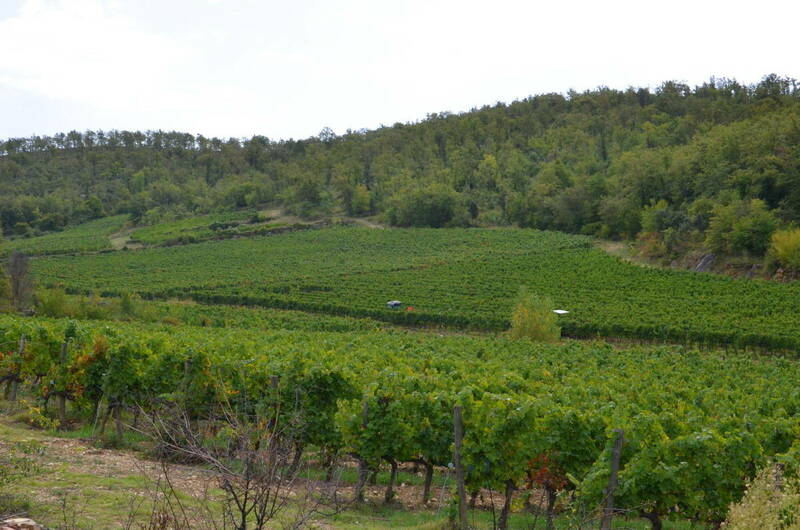 A series of rough trails bisected the vineyard leading up to the winery building at the top of the valley. 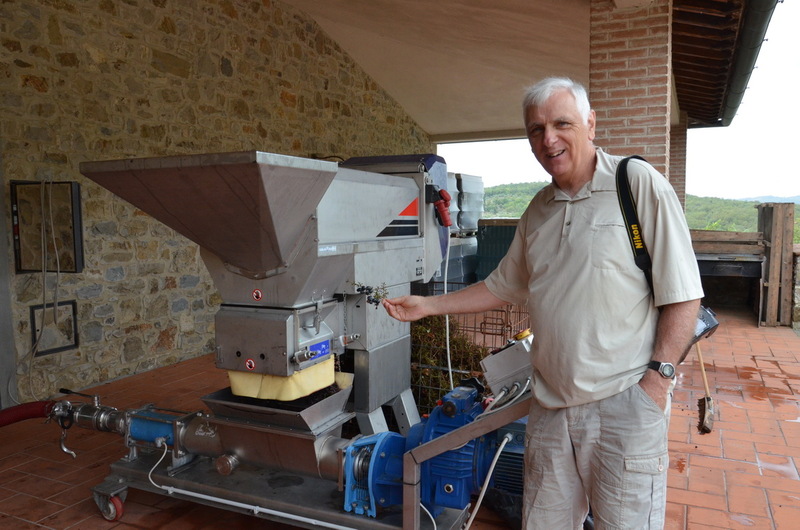 Bob and I hustled ourselves up to the winery building so we could check out the next stage of processing after the grapes were dropped off. 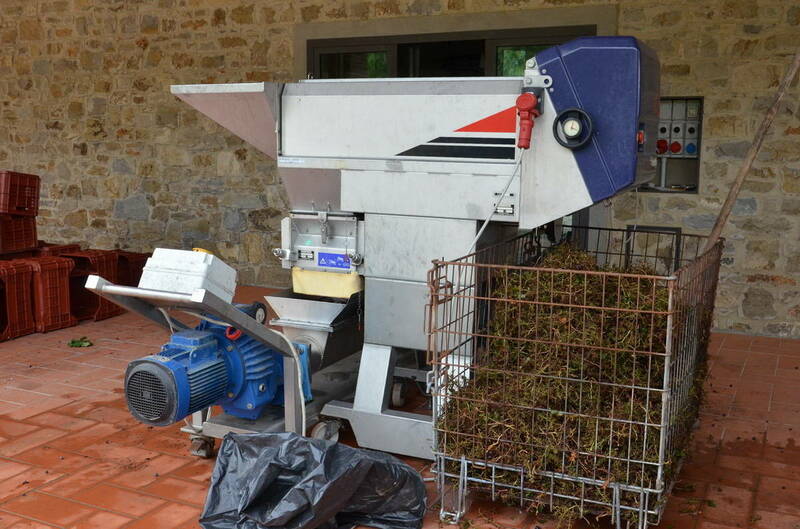 Outside the main structure, on a terracotta patio, stood this grape crusher. You can see all of the discarded stems in the wire cage. 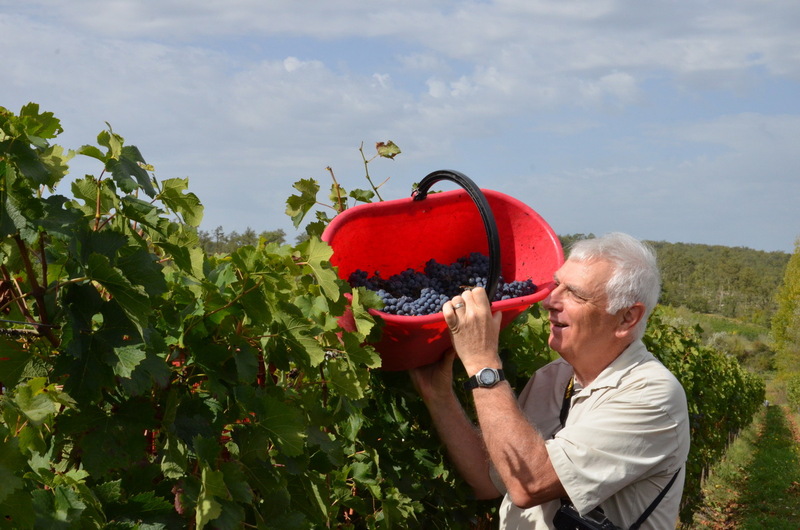 The machine was not running, so Bob picked a small cluster of grapes out of the bin at the front end of the machine. 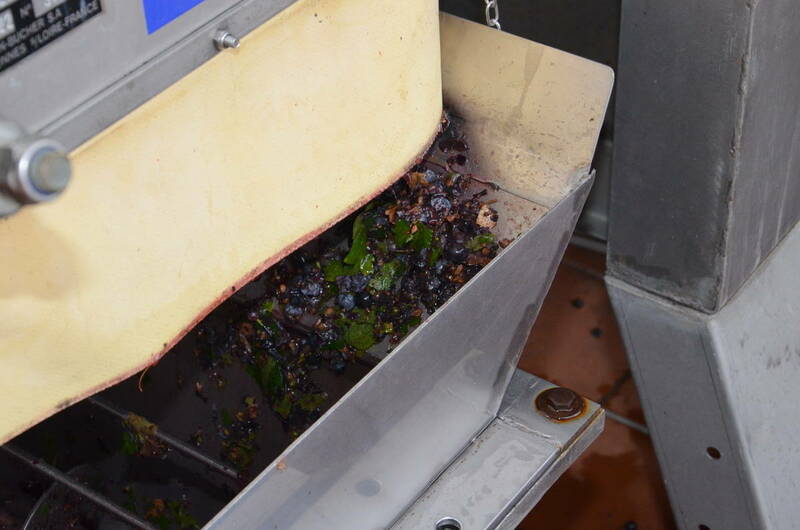 A peak insider the stainless steel bin reveals grapes that are partially crushed. 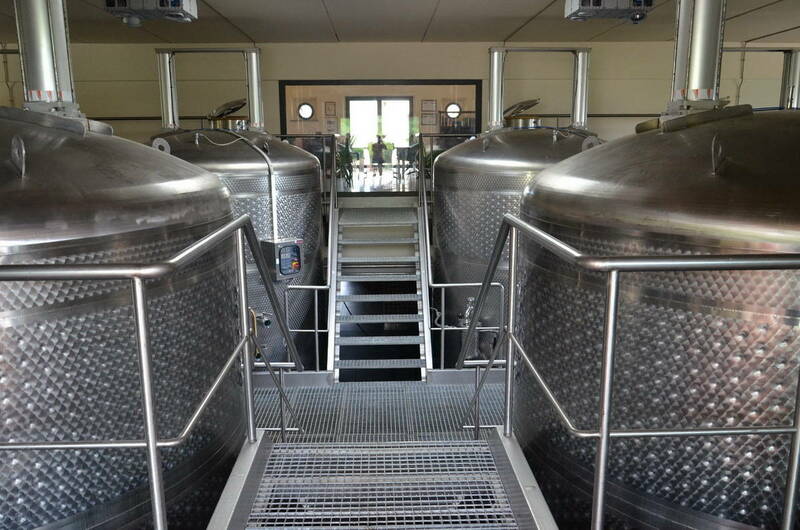 Wine tanks in the tank room gleamed in the soft light coming through the double doors. 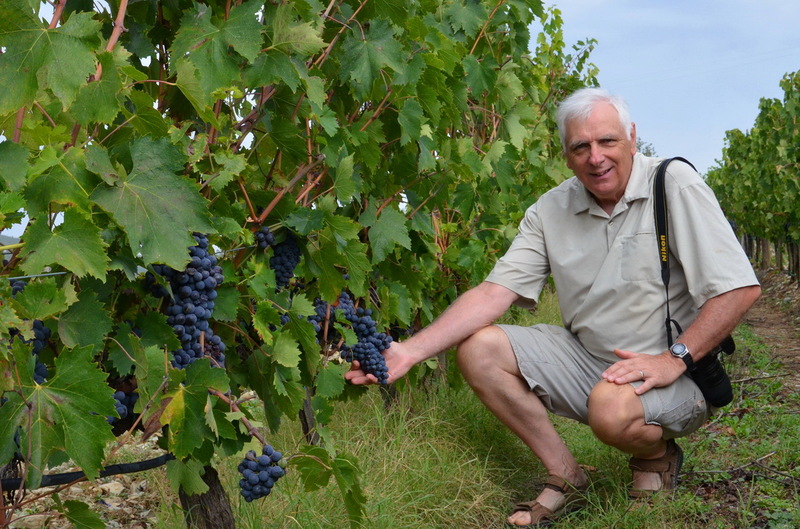 Their immense size gave us some indication of the volumes of grape juice being fermented. 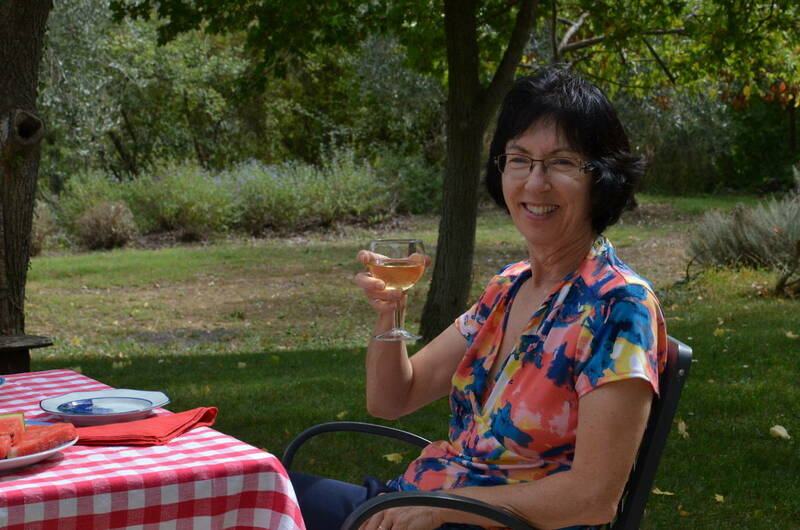 Bob and I had worked up an appetite from our morning’s work, and by the time we finished our self-guided tour of the winery, it was time to have lunch further up the hill at our farmhouse. A more fitting accompaniment to our simple meal could not be found. 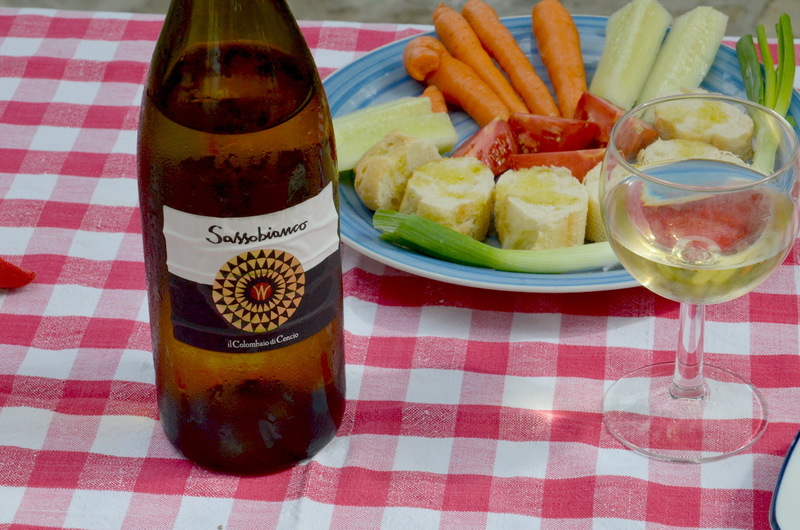 After assisting in the harvest, we had to sample one of the bottles of wine made on site. A modest selection had been provided in our room’s fridge.